The San Francisco Bay Delta Estuary is a large, complex estuarine ecosystem in California. It has been substantially altered by dikes, levees, channelization, pumps, human development, introduced species, dams on its tributary streams and contaminants. The Delta supplies water from the state's wetter northern regions to the drier southern regions and also serves as habitat for many species, some of which are threatened and endangered. The restoration of water exacerbated tensions over water allocation in recent years, and have led to various attempts to develop comprehensive plans to provide reliable water supplies and to protect the ecosystem. One of these plans is the Bay Delta Conservation Plan (BDCP). 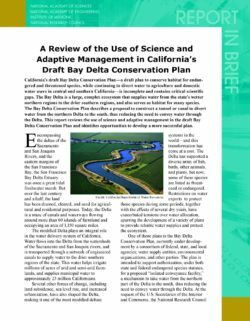 The report, A Review of the Use of Science and Adaptive Management in California's Draft Bay Delta Conservation Plan, determines that the plan is incomplete in a number of important areas and takes this opportunity to identify key scientific and structural gaps that, if addressed, could lead to a more successful and comprehensive final BDCP. The plan is missing the type of structure usually associated with current planning methods in which the goals and objectives are specified, alternative measure for achieving the objectives are introduced and analyzed, and a course of action in identified based on analytical optimization of economic, social, and environmental factors. Yet the panel underscores the importance of a credible and a robust BDCP in addressing the various water management problems that beset the Delta. A stronger, more complete, and more scientifically credible BDCP that effectively integrates and utilizes science could indeed pave the way toward the next generation of solutions to California's chronic water problems. The California Bay-Delta region receives fresh water from the Sacramento and San Joaquin rivers and their tributaries, and some of that water is diverted for agriculture and southern California metropolitan areas. However, the region's growing population and engineered water-control systems have substantially altered the delta ecosystem and have changed the composition of fish species; while some native species have declined, some introduced species have increased. This report provides a scientific evaluation of two "biological opinions" issued by the U.S. Fish and Wildlife Service and the National Marine Fisheries Service in 2008 and 2009, respectively, that require actions to reduce adverse effects of water diversions on delta smelt, Chinook salmon, Central Valley steelhead, and green sturgeon, such as restricting water diversions during certain periods. The report concludes that most of the actions are scientifically justified, but many need clarification concerning details. For example, the Fish and Wildlife Service and the National Marine Fisheries Service actions to reduce risks to delta smelt and juvenile salmon and steelhead by limiting how much water is pumped from the delta in winter have a sound conceptual basis. However, the data do not permit a confident identification of when to limit pumping or the benefits fish receive. Thus careful monitoring, adaptive management, and additional analyses are needed. The report further concludes that our understanding of the risks to the fishes and the benefits likely to accrue from the actions requires an integrated, quantitative analytical framework that ties the various actions together within the species, between smelt and salmonids and sturgeon, and across the watershed. The lack of such an integrated analytic framework hampers both the agencies' and the committee's ability to thoroughly evaluate the effects of the RPAs on the fishes, on water quality and quantity in the delta, and on water operations. A proposed U.S. Fish and Wildlife Service action to create or restore 8,000 acres of intertidal and subtidal habitat in the delta is weakly justified, because the relationship between tidal habitats and food availability for smelt is poorly understood. A proposed U.S. Fish and Wildlife Service action to manage the contour line of 2 parts per thousand salinity, called X2, is beneficial to smelt needs further clarification. A proposed U.S. Fish and Wildlife Service action to protect delta smelt by limiting how much water is pumped from the delta to reduce reverse flows in the Old and Middle rivers, two branches of the San Joaquin River is scientifically justified; however, the data do not permit confident identification of when to limit reverse flows or of the benefits fish receive, so careful monitoring, adaptive management, and additional analyses is needed. Adverse effects of all other stressors on the listed fish -- such as contaminants in the delta and structures on rivers that block fishes from access to their spawning habitat -- are potentially large. Regarding a Nation Marine Fisheries Service biological opinion, which applies to the Chinook salmon, steelhead, and green sturgeon in the delta and farther upstream, the committee concluded that on balance the actions are scientifically justified; however, specific environmental triggers, thresholds, and flows should receive additional evaluation that is integrated with the analyses of similar actions for delta smelt. Reversing or even slowing the declines of the listed fish species cannot be accomplished immediately. 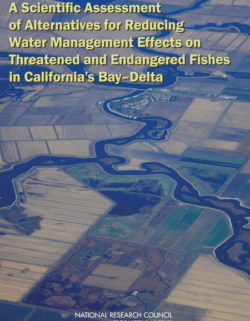 The effects of an increasing population and the operation of the engineered water-control system have substantially altered the delta ecosystem, including its fish species. Using science to adaptively guide management for the Sacramento-San Joaquin Delta is widely talked about as good public policy. Almost every agency, stakeholder, and planning process professes support and has its own adaptive management and science efforts. But highly fragmented adaptive management and science cannot solve such urgent complex problems. California’s 2009 Delta Reform Act recognized that meeting the co-equal goals of a sustainable ecosystem and water supply reliability in the Delta required major changes in governance, planning, and management. Such changes also require major changes in how science is organized and employed in management. 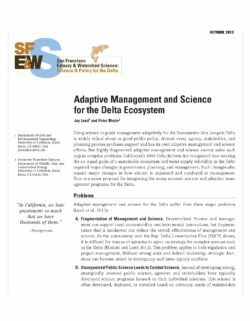 Here is a straw proposal for integrating the many parochial science and adaptive management programs for the Delta. Adaptive management is the process of incorporating new scientific and programmatic information into the implementation of a project or plan to ensure that the goals of the activity are being reached efficiently. It promotes flexible decision-making to modify existing activities or create new activities if new circumstances arise (e.g., new scientific information) or if projects are not meeting their goals. The complex and dynamic nature of ecosystems make their restoration and management amenable to an adaptive management approach, and the concept is being implemented at scales that include entire regions or river basins. Adaptive management has been used to guide several major ecosystem restoration efforts with involvement by the federal government, including those on the Colorado and Platte rivers. Some of these adaptive management efforts have been specifically authorized by Congress, whereas other efforts have been formulated by agencies. Adaptive management has also been proposed as a guiding principle for several new and ongoing major restoration efforts, including those in the Chesapeake Bay and Lake Tahoe. The concept of adaptive management is straightforward, but its implementation can be difficult. A preliminary review of federal adaptive management efforts related to ecosystem restoration projects suggests that governance structures, management protocol and other factors vary widely. Additionally, the scope and timing of efforts employing the term “adaptive management” seems to vary among these projects. Where adaptive management has been implemented, it has encountered challenges. While adaptive management theoretically uses the best available science and monitoring to guide a project or program towards its stated goals, in practice the process can be affected by a number of outside factors. As the number of federal adaptive management efforts grows, Congress may revisit its role in shaping adaptive management programs in legislation. Some argue that Congress should do more to provide specific direction for major adaptive management initiatives in order to make adaptive management more consistent among these efforts. 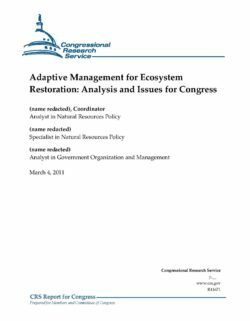 Others contend that Congress should allow federal agencies or restoration governing bodies to shape their own adaptive management programs, thus providing them with flexibility to match their program to their restoration needs. In addressing adaptive management, Congress may face decisions regarding the implementation guidelines and authorizations it provides these efforts, funds to establish and carry out these programs, and oversight issues. 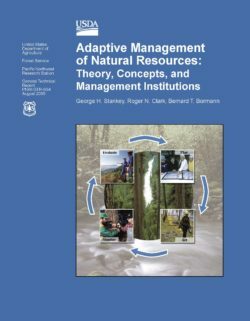 This report provides an introduction to the concept of adaptive management. It focuses on the application of this concept to large, freshwater aquatic ecosystem restoration projects with multiple stakeholders. 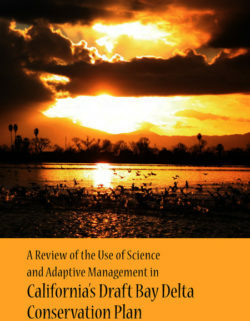 A summary of the benefits and drawbacks of adaptive management for these projects is provided, along with analysis of potential issues associated with various governance models for these efforts. The potential role for Congress in addressing adaptive management is also discussed. As an appendix, the report summarizes the structure and implementation of federal adaptive management efforts to date five ecosystems: Glen Canyon/Colorado River, Platte River, Lower Colorado River, Missouri River, and Florida Everglades. 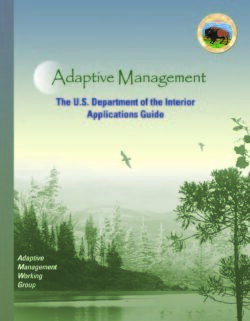 This report reviews the extensive and growing literature on the concept and application of adaptive management. 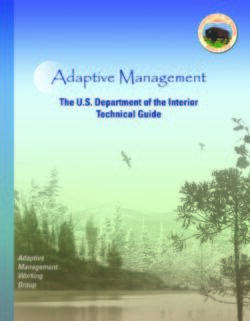 Adaptive management is a central element of the Northwest Forest Plan and there is a need for an informed understanding of the key theories, concepts, and frameworks upon which it is founded. Literature from a diverse range of fields including social learning, risk and uncertainty, and institutional analysis was reviewed, particularly as it related to application in an adaptive management context. The review identifies opportunities as well as barriers that adaptive management faces. It concludes by describing steps that must be taken to implement adaptive management. 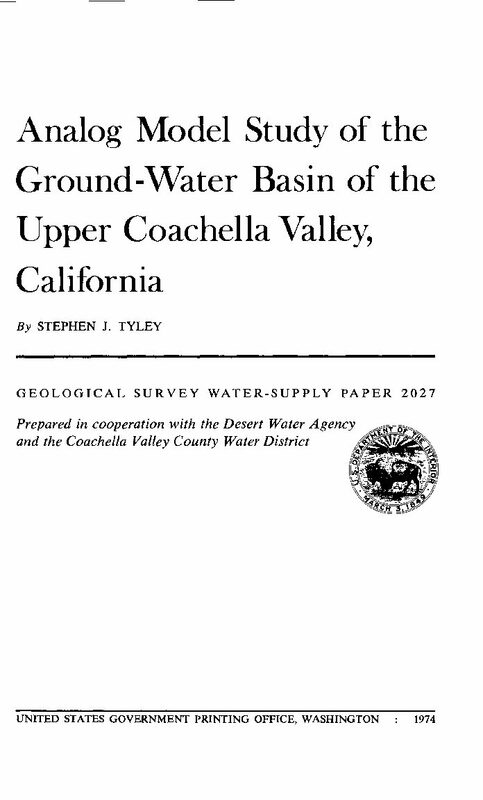 An analog model of the ground-water basin of the upper Coachella Valley was constructed to determine the effects of imported water on ground-water levels. The model was considered verified when the ground-water levels generated by the model approximated the historical change in water levels of the ground-water basin caused by man's activities for the period 1936-67. The ground-water basin was almost unaffected by man's activities until about 1945 when ground-water development caused the water levels to begin to decline. The Palm Springs area has had the largest water-level decline, 75 feet since 1936, because of large pumpage, reduced natural inflow from the San Gorgonio Pass area, and diversions of natural inflows at Snow and Falls Creeks and Chino Canyon starting in 1945. The San Gorgonio Pass inflow had been reduced from about 13,000 acre-feet in 1936 to about 9,000 acre-feet by 1967 because of increased ground-water pumpage in the San Gorgonio Pass area, dewatering of the San Gorgonio Pass area that took place when the tunnel for the Metropolitan Water District of Southern California was drilled, and diversions ofsurface inflow at Snow and Falls Creeks. In addition, 1944-64 was a period of below-normal precipitation which, in part, contributed to the declines in water levels in the Coachella Valley. The Desert Hot Springs, Garnet Hill, and Mission Creek subbasins have had relatively little development; consequently, the water-level declines have been small, ranging from 5 to 15 feet since 1936. In the Point Happy area a decline of about 2 feet per year continued until 1949 when delivery of Colorado River water to the lower valley through the Coachella Canal was initiated. Since 1949 the water levels in the Point Happy area have been rising and by 1967 were above their 1936 levels. The Whitewater River subbasin includes the largest aquifer in the basin, having sustained ground-water pumpage of about 740,000 acre-feet from 1936 to 1967, and will probably continue to provide the most significant supply of ground water for the upper valley. The total ground-water storage depletion for the entire upper valley for 1936-67 was about 600,000 acre-feet, an average stor age decrease of about 25,000 acre-feet per year since 1945. Transmissivity for the Whitewater River subbasin ranges from 360,000 gal- lons per day per foot (near Point Happy) to 50,000 gallons per day per foot, with most of the subbasin about 300,000 gallons per day per foot. In contrast, the transmissivities of the Desert Hot Springs, Mission Creek, and Garnet Hill sub-basins generally range from 2,000 to 100,000, but the highest value, beneath the Mission Creek streambed deposits, is 200,000 gallons per day per foot; the transmissivity for most of the area of the three subbasins is 30,000 gallons per day per foot. The storage coefficients are representative of water-table conditions, ranging from 0.18 beneath the Mission Creek stream deposits to 0.06 in the Palm Springs area. The model indicated that the outflow at Point Happy decreased from 50,000 acre-feet in 1936 to 30,000 acre-feet by 1967 as a result of the rising water levels in the lower valley. The most logical area to recharge the Colorado River water is the Windy Point-Whitewater area, where adequate percolation rates of 2 4 acre-feet per acre per day are probable. The Whitewater River bed may be the best location to spread the water if the largest part of the imported water can be recharged during low-flow periods. The area in sec. 21, T. 2 S., R. 4 E., would be adequate for the smaller quantities of recharge proposed for the Mission Creek area. Projected pumpage for the period 1968-2000 was programed on the model with the proposed recharge of Colorado River water for the same period. The model indicated a maximum water-level increase of 200 feet above the 1967 water level at Windy Point, the proposed recharge site, by the year 2000, a 130-foot increase by 1990, and a 20-foot increase by 1980. The model indicated that the proposed quantities of recharge will beneficially affect the ground-water system to Palm Desert by 1980, to Point Happy by 1990, and possibly to the Coachella Canal by 2000. The model indicated that the upper and lower valleys are within the same hydrologic system, and it has been proposed that the model be extended to the Salton Sea. On the basis of the available analyses, changes in the quality of ground water in the Whitewater River subbasin after recharge apparently will be, as a first approximation, proportional to the ratio in which the quantity of recharge and the quantity of ground water are mixed. Where mixing does not occur, the quality of the recharge water will probably not be greatly changed by ion-exchange phenomenon. Can Los Osos Valley Groundwater Basin Provide a Sustainable Water Supply? The aquifers underlying the community of Los Osos in California are impaired by nitrate pollution from septic systems (shallow aquifers) and saltwater intrusion from overdraft (lower aquifers). The development of a centralized waste water system, now in the final pre- construction stages, is proceeding concurrently with an adjudicated basin planning process involving local water purveyors in an effort to develop a management plan for a sustainable basin and water supply. Development of the wastewater system aimed at protecting the shallow aquifer has highlighted the need for a comprehensive groundwater basin management plan that focuses the County, the local water purveyors, the residents, and resource agencies on a common set of actions to stop seawater intrusion and protect the entire basin. The final basin management plan will be scrutinized and critiqued as a potential model for myriad other hydrologically independent communities that are, or will soon be, undergoing the similar quest for reliable water. Stakeholders in the Los Osos Valley Water Basin have the opportunity to lead coastal California on the difficult path toward sustainable water supply through creative local solutions that do not presume the long-term viability of imported water or desalination. The saltwater intrusion models used in the draft EIR and technical memoranda (TMs) recently developed for the purveyor basin planning process attempt to balance saltwater intrusion against inputs and outputs to and from the aquifers. The net groundwater extraction amounts simulated in the models (corresponding to the purported safe yields) are considered aggressive (too much extraction) because they do not stabilize, or result in seaward migration, of the saltwater/freshwater interface (toward the northwest). In fact, the TM safe yield may allow the saltwater to move inland, especially if California climate becomes drier, as projected by State Government. Modeling results presented in our report indicate that if rainfall patterns persist as they have in the past, there is a reasonable chance that saltwater intrusion will progress farther, rather than remain stable, under anticipated pumping conditions. Further investigation is recommended to resolve uncertainties associated with the TM safe yields, including permeability of the regional (AT2) aquitard, how the AT2 affects lower aquifer recharge, and whether sufficient recharge will occur to prevent seawater intrusion in the upper aquifer. These uncertainties are under- appreciated in the EIR and TMs. We recommend the development of a “contingency plan” that allows flexible adaptive management to address unintended consequences that may occur following the implementation of the Los Osos Valley Wastewater Plan. Contingency plans identify mission-critical sections of the plan that have uncertainties, recommend monitoring to ascertain progress of the plan, and define remedial actions that will mitigate various unintended consequences, including divergence from, or failure of the plan. Several mission-critical arenas are discussed in the report. Rooftop rainwater harvesting and low impact development (LID) options could produce a substantial amount of water for local irrigation, reducing potable water use, while also augmenting groundwater recharge. Some LID alternatives, e.g., rain gardens and vegetated swales, can also provide attractive low-water using landscape features that may also help Los Osos residents adapt to the potential changes in groundwater levels and soil moisture content resulting from project implementation that may affect landscaping. Both on-site and community LID features will also reduce pollution of surface waters in the area. While the method used to calculate potential basin recharge from rainwater and LID features in this report is inconclusive, it suggests that the benefits of these measures may be considerable. Rainwater harvesting and LID are proven technologies that should be considered on a broad basis in the Los Osos Valley to help balance the basin and adapt to potential impacts from the project. Treatment wetlands can provide economical, efficient waste water treatment systems and/or the means to provide additional treatment, storage, and recharge of the groundwater basin. They also provide habitat and quality of life benefits (open space and passive recreational opportunities, such as hiking trails). Nitrate removal in wetlands has been studied in small scale experiments in Monterey County, has been implemented in large scale applications with positive success. Wetlands to treat surface water and wastewater have been used successfully in many communities around the world. We recommend an emphasis on agricultural exchange to maximize its benefits on seawater intrusion and help balance the basin. Tertiary-treated waste water is safe for irrigation and can reduce groundwater pumping, as well as energy and fertilizer use for farmers, with related costs savings. When well water from farms is exchanged for recycled water, potable water can be used to offset pumping causing seawater intrusion. While it is best to balance the hydrologic budget using resources within the basin, there is also an option to trade agricultural-grade treated water to regional farms in exchange for drinking grade water from wells outside the basin if ample water reserves are developed in the future. The draft Los Osos Valley sustainable water basin management plan, “Achieving a sustainable Los Osos Valley Water Basin: Framework for a 21st century basin management plan” (Wimer 2009) presents realistic, well-supported solutions for addressing the water needs of the Los Osos Community using sustainable, water saving and LID methods while preserving the basin for future use. The plan integrates methods reviewed in this report (rainwater harvesting, LID, and agriculture exchange), with urban reuse and intensive indoor and outdoor conservation to balance the basin and provide flows to sensitive ecosystems, with margins of safety that also address current and future uncertainties. We recommend that the plan is further developed, possibly with the help of water use efficiency expert, and considered for implementation. To answer the question posed by the title--yes, Los Osos can become a model of sustainable water use for coastal California if stakeholders implement reasonable conservation measures to complement an appropriate waste water treatment strategy and an adaptive management plan. The great number of uncertainties in the system makes any plan “experimental.” Given the uncertainties, due diligence will include erring on the side of caution (being conservative, not aggressive, in planned groundwater production), and devising a realistic contingency plan that includes adaptive management strategies. 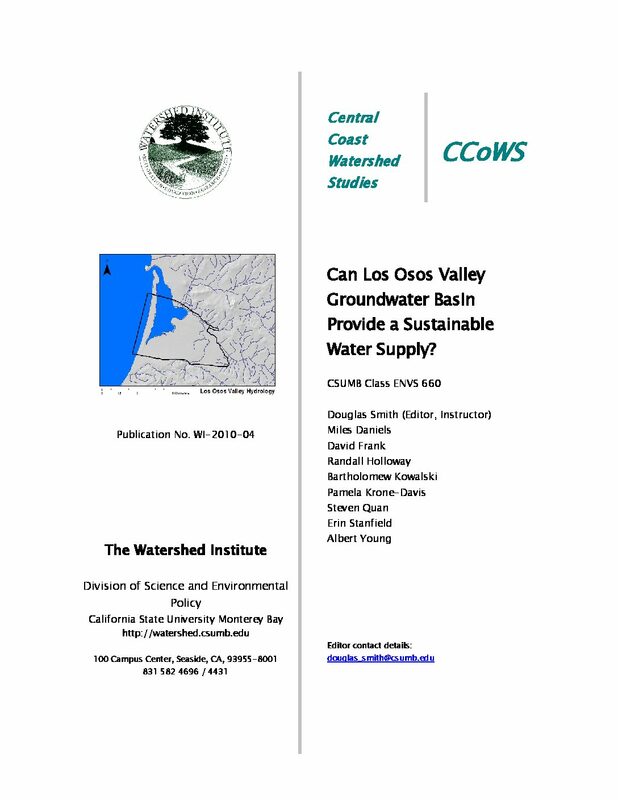 The Advanced Watershed Science and Policy (ENVS 660) graduate course at California State University Monterey Bay produced this report. It presents the results of extensive literature review, synthesis, and new analyses. The breadth of the report spans many of the key water supply issues facing the people of the Los Osos Valley. It provides information that can help this region move toward a sustainable water supply through innovative waste water management and sound conservation measures.